Located 30 miles east of Prineville, Ochoco Divide Campground is a convenient place to camp while traveling across scenic State Highway 26 by bicycle or car. Because many travelers use the campground as a quick stopover, arriving at night and leaving in the morning, it is generally very peaceful during the day. For those who prefer to linger, nearby recreational activities include birding, hiking, hunting, mountain biking, nature viewing, and road biking. Ochoco Divide Campground is at the top of the Ochoco Divide in a ponderosa pine forest and at an elevation of 4,700 ft., it is easy to access but offers the high-altitude forest feel that many campers desire. The campground consists of 25 single tent sites, some of which can accommodate camping trailers. Amenities include a picnic table at each site and vault toilets that serve the entire campground. Reservations can be made six months in advance and the per night, per site fee is $13 for the first vehicle and $8.00 for each additional vehicle. 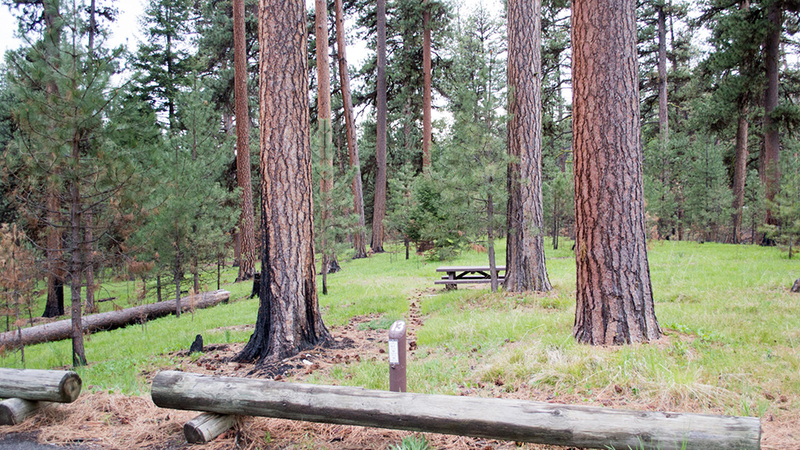 Ochoco Divide Campground also maintains three day use sites ($5 per vehicle) which provide convenient, serene picnicking opportunities for those looking to take a break during their travels.